IMG_1102, originally uploaded by All Things Mimi. We had a hunk of it in our fridge. So...I decided to make mac and cheese out of it. Unfortunately, I wasn't going by a recipe, so I can't tell you exactly how I did it. I can give you a blow by blow, but that's about it. I started by sauteeing an onion in olive oil and butter (if I had to guess at amounts, I'd say maybe a couple of tablespoons of butter and one tablespoon of olive oil). Oh- and I started boiling the elbow pasta. I boiled about half a pound of pasta for 8 minutes, then drained it. After the onions had softened (about maybe 5 minutes), I added flour. How much? I have no idea- maybe a quarter cup? I let it cook like a roux for about 5 minutes. I added a little salt and a few drops of hot sauce at this point. I had managed to eek 2 cups of dairy liquid out of my fridge- I had about 1/2 cup of 2% milk, about 1 cup of half and half and maybe 1/2 cup of white wine. I whisked the liquid into the bubbling roux and stirred until it began thickening. When it got nice and thick, I took it off the heat and added about 2 cups of grated cheese. I used about a half a cup of gouda, a cup of cheddar and half a cup of parmesan. I whisked until the sauce was smooth. I poured the sauce over the pasta and stirred it together. Into a greased casserole dish it went, then I made a topping of breadcrumbs and olive oil and sprinkled that on top. It hung out in a 375 degree oven for about 20 minutes, until the top was brown and the cheese was all happy and talkative. I served this with some fish steaks I had in the freezer. The steaks were seasoned with blackening spices and then baked with the casserole for the last 15 minutes. 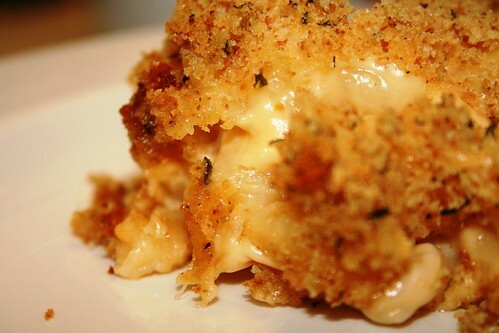 The fish was not at all photogenic, but the mac and cheese was appropriately gooey looking! Mimi, thanks for sharing a great looking mac n cheese with Presto Pasta Nights. It looks awesome and now I have yet another version to try! As for using Presto Pasta Night image...of course you can and I do hope you get to share more dishes with us. Oh, that looks so good! I have been trying to get creative and come up with a really great mac & cheese... I may use some of what you did and see what I can come up with!